England, 1964. Mary is seventeen, single and seven months pregnant. Bundled off to St Saviours, a Church of England-run mother and baby home, her concerned mother has arranged for Mary's baby to be adopted immediately it is born. The girls in the home find comfort in each other's friendship, but ultimately they must face their individual tragedies alone. Set to the uplifting sounds of 60s girl-group pop 'Be My Baby' follows Mary and her fellow inmates as they cling to youthful fantasies of romance and marriage but instead are drawn inexorably towards outraged, powerless adulthood. Amanda Whittington was born in Nottingham in 1968. After leaving school she worked as a freelance journalist for a variety of publications and was a columnist for the Nottingham Evening Post. 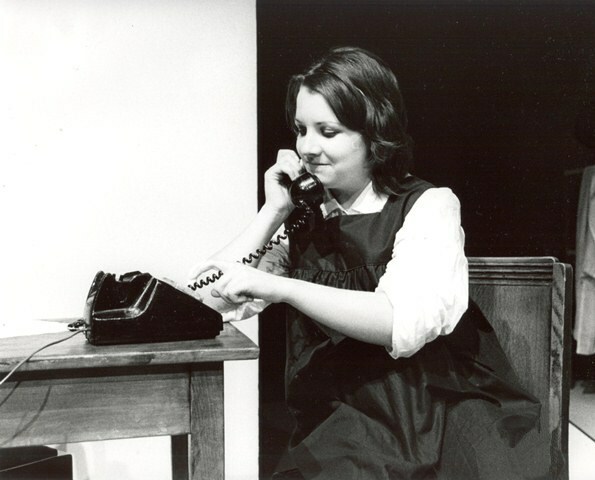 Amanda's earliest plays - 'Home Comforts' and 'Stand Up Cherry Pie' - were staged by Takeaway Theatre in Nottingham pubs. She wrote 'Twist and Shout' for Mansfield based Young Perspectives, which was a hit at the 1998 National Youth Arts Festival and led to the commission of a sequel, 'Runaway Girl'. 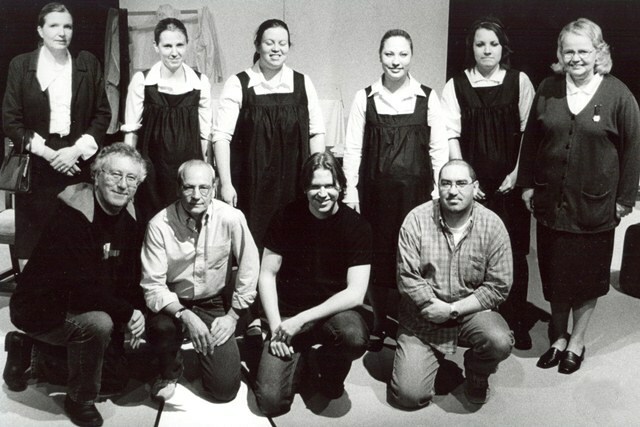 The cigarette factory drama 'Player's Angels' was written for New Perspectives and toured the East Midlands in 1999. 'Be My Baby' takes place over 2 months in 1964. It is set in St Saviour's, a Church of England-run mother and baby home in the North of England. The story follows the lives of 4 unmarried and pregnant girls, at the home. It shows how the girls bind in adversity but also how each must deal alone with the ultimate enforced separation from her child. The characters sing and dance throughout the play as they compare their lives to the popular songs of the day. 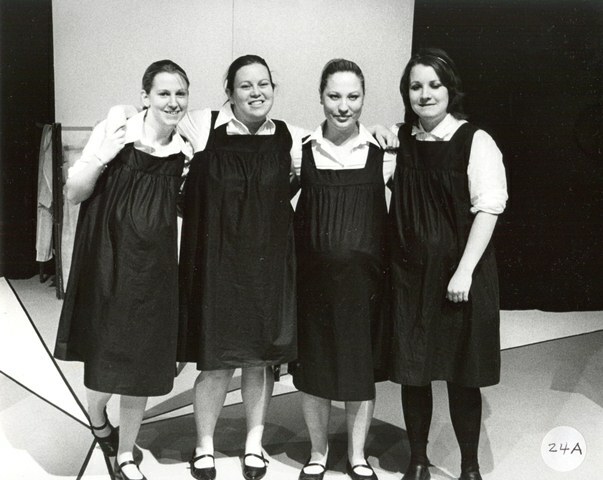 'Be My Baby' was created as part of Soho Theatre Company's Writers Development Programme. 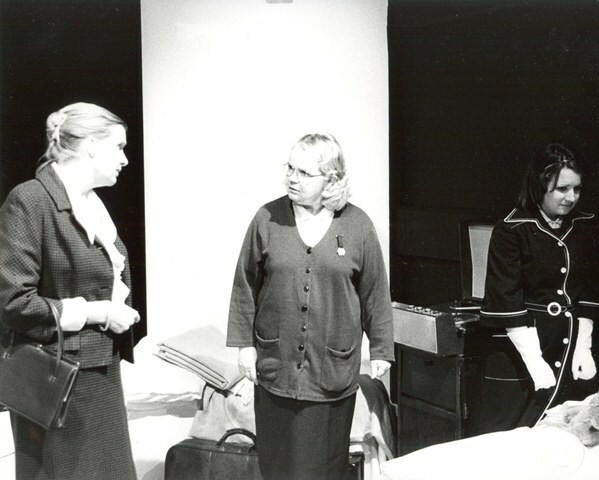 In 1998 it featured in Soho's 'Five Plays:Four Weeks' season at the Pleasance Theatre, London. 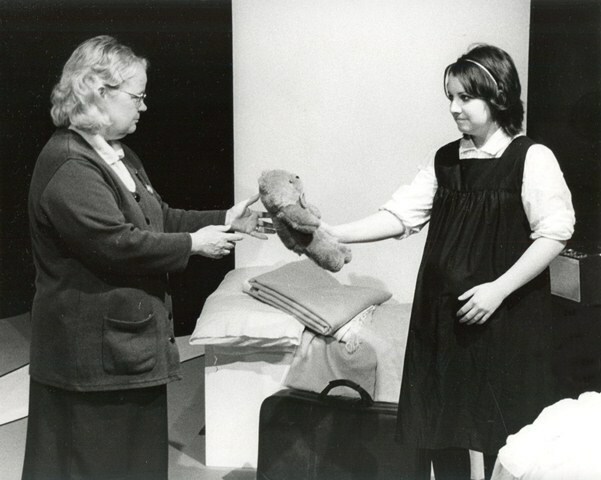 'Be My Baby' was subsequently staged in the opening season of the Soho Theatre and Writer's Centre in May 2000. So, why this play? to be honest, it was a complete accident. Following the production of 'Picasso at the Lapin Agile' last February, I knew I wanted to direct with the Bench again. but I had no real ideas as to what the play might be. I looked around the rest of the Bench season and saw that the majority of acting opportunities were for men. Ever one with an eye for an opening I started looking for plays with roles for women, (I figured it might be a vote winner!). 'Be My Baby' was one of the plays I read. I read it once and was hooked. 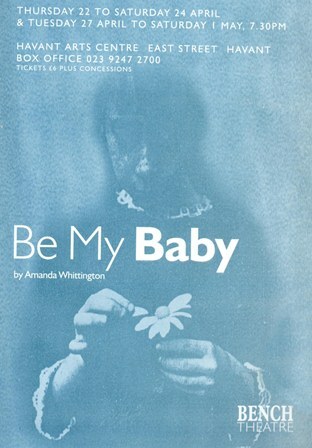 'Be My Baby' is a play with so many things to recommend it, it has six lovely characters for actors to enjoy, it uses music in an imaginative and integral way, it has warmth and humour throughout, it tells its essentially simple story in an uncomplicated yet sophisticated way and it has something to say without being the least bit preachy. Above all, the play has a huge heart. Additionally, as a director, I am always looking for something new to tackle, indeed I have a list of production types that, sooner or later, I want to have a go at with the Bench. Already crossed off the list? Shakespeare, 'King Lear'; epic Brecht, 'Mother Courage and her Children'; Comedy, 'Picasso at the Lapin Agile'; Small Cast, 'Faith Healer'; and now, with 'Be My Baby', I can cross off the list an all-female cast play. It is one of the great joys of being part of the Bench that the Company is never afraid of a theatrical challenge. A quick look at our recent shows demonstrates the vast range of styles, tastes and influences that the Company feeds off. Outside of the professional theatre where else could you find Neil Simon, William Shakespeare, Steve Martin, Connor McPherson, Ronald Harwood, Bertolt Brecht, John Godber, Anton Chekhov, Edward Bond and Tom Stoppard sitting comfortably together? And that doesn't even begin to encompass projects such as Supernova, the festival of original one-act plays last staged in September 2003. I hope that 'Be My Baby' proves to be a worthy addition to the line up. "She's a willing kind of girl," says the mother of a pregnant 19-year-old. "Well, when I say willing..." Cue laughter, cue realisation of the shame of such a situation in 1964 middle-class England. But that does not make Amanda Whittington's play dated. 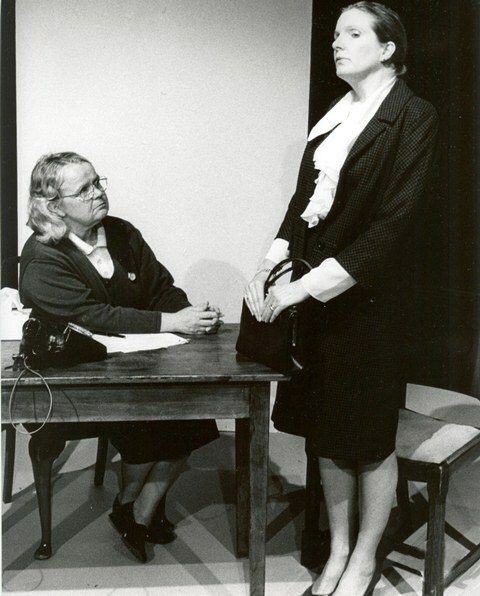 It was first staged only in 1998, and Bench Theatre's production shows it is about much more than 1960s attitudes. It is set in a Church of England home where girls go to have their babies and give them up for adoption, and uses the Ronettes' Be My Baby and other 1960s hits to express female aspirations. But this non-judgemental play is about comradeship as well as suffering. Director Damon Wakelin, working with an all-female cast, draws from 'improvised' dance routines and a nappy-pinning scene. 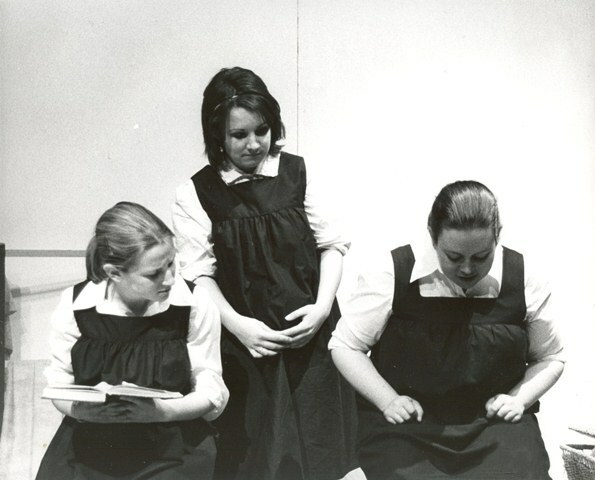 All four girls are well-played, but if one stands out it is the very natural Lynda Fleming as the seen-it-all-before type, Queenie - truculent but vibrant and warm-hearted. 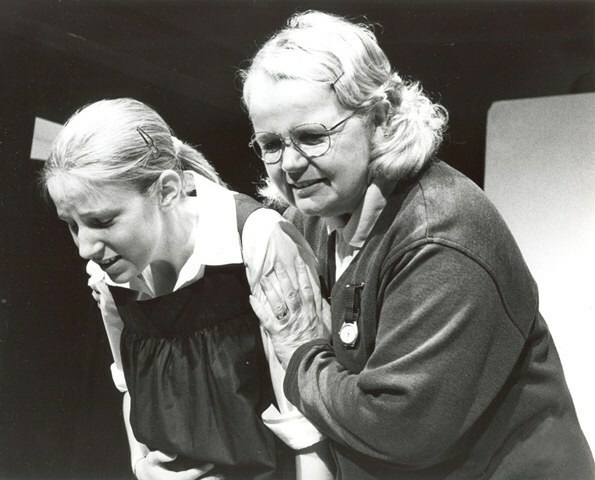 Also crucial is Ingrid Corrigan's performance as the Matron - severe, purse-lipped, but with a kindliness that hints at a past of her own. Yet when she tells a new mother "It's over," the stab of pain is sharp. You want to retort, "Is it?" because today as then, giving up a child is not the end.